The brown sign says “Malabar Farm 9” and on a whim, I pull my car off to the right. I’ve got time. This isn’t my first trip to Malabar. Years ago, we took a tour there, marveled at the author’s books on the bookshelf, listened to stories of his wife’s interior design. We admired wallpaper and bedspreads and looked at ourselves in the ornate mirrors of the Big House. But today my visit is fleeting; I simply stopped to smell the cow poo. It’s still early; the gardener is weeding the patches of mulch around the flower bushes, just down the steps from where Bacall and Bogey posed for their wedding pictures. There’s a carving of Ganesha over the doorway. I notice that birds have built a nest behind it. Behind me, the green hills of Richland County roll out in waves, the sound of a distant mower revs up from behind a line of trees. The sky is a bright and intense blue, spotted with cotton ball clouds: unreal, like a child’s Sunday school project. A rooster crows, a sheep baas. I peer over the fence at the animals in their pens. What a good life they have here in these hills. “Do you want me to take your picture in front of the cows or something?” says an approaching farmer, lifting his John Deere hat off his brow, smiling his tanned cheeks at me and placing his arms akimbo. But, dear farmer, I want to say, I am in the picture. I’m here in this picture as much as that famous Hollywood wedding is still here, as much as Bromfield atop his tractor. My face is in these hills, this sky. This farm is why my grandparents met. This is where my dad would ride his motorcycle, this is where his sisters would go blueberry picking. My grandparents, buried up the hill and around the bend, are now part of this earth, part of every blade of grass. My story is in these hills, in the dust we’re stirring here now, exchanging words next to braying donkeys and clucking chicks. I wanted to tell him: I am in the picture. I always will be. Later, on the phone with Dad, I tell him where I stopped today, and say how lucky I think he was to grow up in one of the most beautiful places in the world. On the other end of the phone line, there’s a brief, wistful silence, and I think how he’ll always be right there in that picture too. As the car came down out of the hills and turned off the Pinhook Road the whole of the valley, covered in snow, lay spread out before us with the ice-blue creek wandering through it between the two high sandstone ridges where the trees, black and bare, rose against the winter sky. And suddenly I knew where I was. I had come home! Louis Bromfield was a Columbia-educated Pulitzer Prize winning author and screenwriter, who, just before the onset of World War II, decided to pluck his family from the approaching march of danger and move them to the valley where he grew up in Ohio. He bought acres of land in Pleasant Valley, at the heart of the lush rolling landscape between Columbus and Cleveland. He was primarily interested in soil conservation, a hot topic after aggressive farming practices had destroyed the topsoil, desiccating lands all across the country, and ultimately causing the economic and environmental tragedy of the Dust Bowl. And more than anything, he wanted to get his hands back in the soil, a lifestyle he had learned while growing up on his grandfather’s farm. On a recent trip back to Ohio, we took a tour of Malabar Farm. We walked through Bromfield’s office, where he lived the dual life of farm owner and author. We saw the hall where Lauren Bacall married Humphrey Bogart, and the bedroom of Bromfield’s literary manager, modeled after his favorite hotel room in New York. We admired the furniture imported by Mrs. Bromfield from their pre-war Parisian home. 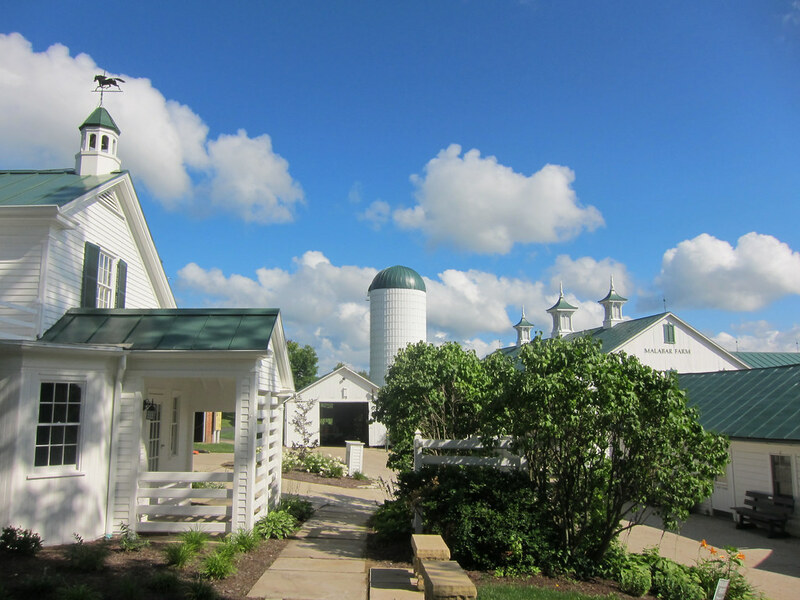 Malabar Farm was a realization of my dream: at the crossroads of Hollywood, Europe, New York, and rural Ohio. But it was beyond the walls of the farmhouse, in the land described in Pleasant Valley, where the romance really came to life for me. My dad grew up in the area around Pleasant Valley, and the story of Bromfield is wrapped up in my mind with the story of my dad. As I read the Bromfield book, I would mention locations to him, and he’d tell me stories. About the motorcycle boys in the sixties who used to ride along Pinhook Road, about the motorcycle my dad bought to join them. About the hush that crept through the town when Bromfield died. I even discovered the story of my grandparents’ first encounter while reading Bromfield: it was the wife of Bromfield’s farm manager, Max Drake, who invited my grandmother to the 4H dance where she first laid eyes on my grandfather. Bromfield’s story is also somewhat my own. My childhood was filled with tastes of the lifestyle of the Ohio farmer. We did chores: helped the farmhand Lum change the hay in the stalls, feed the horses. It was on the farm that I first tasted real mint, plucked from the ground by my grandmother as we looked for weeds along the fences. My grandparents took us to ag conferences across the country; they took me to North Carolina, and while my grandfather attended lectures on farm management, I made a lamp out of a mason jar. The things that a farm kid might do, or so it seemed to me. It was the visual beauty of the farm that made it so romantic to me, both then and now. The bales of hay rising to the top of the barn. The brand new kittens in a dark corner, eyes still close after birth. The thunder that never ended, rolling over hill after hill as it crossed the countryside. The first Christmas I brought my husband (when he was still just a boyfriend) to the farm to meet my grandmother, we went to see my cousin’s high school basketball game up the road. When we left the game to head back to the farm, the massive sky was pink, on the verge of a snow storm. As we pulled into my grandmother’s house, a flash of white bolted across the drive. The horses had escaped from the barn. My dad directed me and my husband into triangular positions, surroundings the horses, and slowly we guided them back into the corral and latched the fence. It was my equivalent to Bromfield’s hands in the dirt, and I thought of nothing else on the drive back to New York. It is something I still think about, but I have a dose of realism keeping me grounded in my own urban landscape. That side of my family is full of farmers and ag workers. At a recent family reunion, I told my dad’s cousin how I envied his life, and he looked at me like I was crazy. “It’s not an easy life.” And I told him I was under no illusions: I wouldn’t last a week as a farmer. I love the idea, based on smidgens of memory: The dirt under the fingernails, the early morning silhouette of the barn. The farmstead in winter, with jars of preserves in the pantry. My grandfather in the distance, high on his tractor, mowing the lower field across the road. But I find it hard to imagine the lazy bones in this body doing the work it takes to have that life. And I wonder if, once in it, I would appreciate it in the same way, or if the romance would disappear like the morning mist over the hills. I think my own Pleasant Valley is little more than a sentimental daydream. I grew up laying claim to a city I’ve only just met. I could name you all the roads and neighborhoods, point out landmarks and tell you that Union Terminal was the basis for the Super Friends’ Hall of Justice. But today was the first time I’ve ever done a three-point turn on Hill Road in Mt. Adams, the first time I’ve ever flipped through the used rock vinyl at Shake It Records, talking Drive By Truckers with the guy behind the register. The first time I’ve been greeted by a friendly sheepdog and a warm cup of coffee in Wyoming, or played a couple rounds of pool in Northside Tavern. When we got home from our day out, I looked at a map and realized that the Cincinnati I’d been laying claim to all these years was a tiny strip of Vine Street just east of the university, a neighborhood called Corryville where we’d go to see bands and buy Doc Martens and Manic Panic. A party at a friend’s house in Walnut Hills where I first tried peach Schnapp’s. A piano lesson in Norwood. Just a handful of nights, each one bookended by a trip up or down the safe circumference of distance that was I-275. I’ve been dipping my toes in the rushing water of this city all these years, kidding myself that proximity was enough. Regional pride through osmosis. This is what I have to say: Cincinnati, it’s a pleasure to meet you. You make a good first impression. We watched a car sit in the middle of the road for a good thirty seconds, waiting for a particular parking space to clear in the shadow of a particularly bright set of painted brick buildings, cars stacking up behind him, and no one gave so much as a toot. The man with the long gray hair under a fedora made coffee at the same pace as stalactites form, reminding us that we had all day. We really did have all day. And the hills. You don’t know what you have done to us with your hills. You remind us of possibilities. We spotted a storefront in an up-and-coming section of Over-the-Rhine selling for $80,000. We related this to another nearby shop owner, who said “If the streetcar goes ahead, those places will go fast.” In my head I drew up plans for a bookstore. We came out the other side of Eden Park, high above the city, and were instantly wooed by For Rent and For Sale signs dotting the streets of Mt. Adams, the San Franciscan-like hills suddenly exciting and accessible. So we started writing stories for ourselves, fictions of what life might be like if we lived here, exercising the stiff little bits of our imaginations that have so long been tied to the convenience of the subway, rent-stabilization, job security, and 24-hour delis. We began to exercise our “what if”s. Cincinnati, it feels good to stretch. First things first: Wire & Twine are having a fantastic holiday sale. The Sound Burger tee, based on the fancy little gadget seen above, is on sale for just $12. Scurry on over before they run out of your size. I was carried to Ohio in a swarm of bees. No: I was carried to Ohio in a Nissan filled with salty snacks. While we were home soaking up the love of family and dogs and good food, we decided to knock in on Wendy, Tom, and Chris at Wire & Twine. (The background of how I came to be acquainted with the good folks of Wire & Twine can be found here.) These are people who are instantly kind, welcoming and warm. The fire was already rolling in the fireplace, the cups laid out for coffee. We were greeted with hugs and smiles, the curious and friendly black dog, paw outstretched. After multiple cups of The Perfect Coffee and the obligatory lesson on how to hold a chicken (whatever you do, be sure to hold its wings down or you’ll get a good flap in the face), we got to see the magic of their studio, where their minds set to work. Amidst printing supplies, saw cutters, and a healthy collection of vinyl, Tom’s desk space was speckled here and there with wires and knobs and metal plates, little working pieces of something that might make noise or light up when assembled properly. He cleared a space to show us his pride and joy, the Sound Burger, in motion. 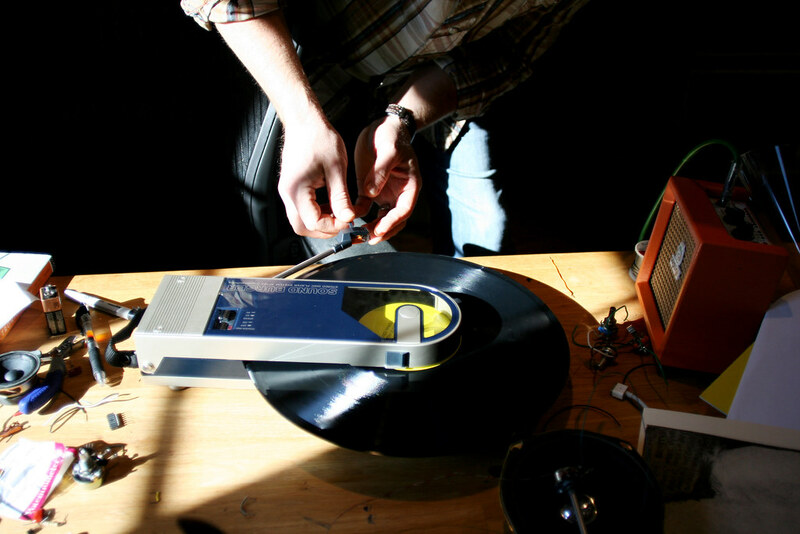 We watched the record spin and marveled that someone would create something so exposed on which to play vinyl. They were more than happy to open up about what it means to live in Ohio. Creativity has no geographical boundaries, of course, but Chris smiled his knowing smile as he told us the kicker: “The difference is that here you have the time to figure out what you want to do.” It stuck in our heads like a skip in the record, looping over and over: Having the time. Limited for time on this particular visit, we said our goodbyes and headed south towards Cincinnati. A quick spin through Hyde Park shot us west to North Avondale, where our friend Vaughan showed off two of his renovation projects, including an enormous and stately house with butler doors and beams in the ceiling and a seemingly endless number of rooms. The scale of things exploded before our eyes, all this room to stretch. Like I said about the city a year ago: it feels good to stretch. We cut through Clifton down a busy Ludlow Street, past an Indian grocers, a library storefront, and the glowing Esquire theater, and punctuated our trip with a traditional stop at Shake It Records in Northside, the stacks humming with a different kind of Black Friday crowd. We drove back up Colerain just past dinnertime, the lights of car dealerships and tire shops turning dusk bright as daylight. Times Square just north of the Ohio River. The Las Vegas strip in the tri-state area, the come-hithery warmth of lit plastic and metal. Some of us have this strange need to break things apart at their hinges, then put them back together again to find what makes them make noise and light up the way they do. I tend to do it with cities: the nuts and bolts of cement, electrical cables, rivers, and roads, adorned with signage, shop windows, and a smattering of people. How does it all fit together? How does it work? The more we break apart Cincinnati, the more we find, all of its working parts, its pulse, a circuitboard running hither and thither over the hills. Maybe one day we’ll have the time to figure out how we might fit in. When the earth shakes in New York, I’m miles away, collecting fossils in a creek bed in Ohio. When the earth shakes in Cincinnati, I’m just around the corner. We spent dinner telling dead cat jokes and arguing over who would pay the check. Full from the salty decadence of a pho-inspired dish named for this pig city on the river, from butternut squash soup and the chocolate cream we split for dessert, we stumbled out onto Vine Street, and turned towards an unexpectedly hushed Fountain Square. Saturday night: there should have been bands. Crowds. People sitting around umbrella-shaded tables; kids chasing each other around the fountain. Instead: barricades, policemen. At the far corner, the waving yellow lines of police tape. We learned about the shooting as we headed for the parking garage. Only the night before we’d been in Fountain Square with our friends Beth and Ryan to see local band Bad Veins. We stood amidst men with an abundance of facial hair cradling plastic cups of craft brews, in the shadow of the lady of the fountain, her arms outstretched and casting out water, taking in the crowds of our new city. There were girls with Bettie Page dos laughing with redheads in tulip shorts and button noses, a woman wearing a linen dress pushing a tired blond boy in a stroller past a group of men playing dominoes. There were arm tattoos and sneakers, there were buxom women dancing at the fountain’s edge, children chasing each other around the waters. Families of four holding hands, weaving through the crowd past a wild looking man in tattered sneakers throwing his hands to the heavens. Older ladies with grey and black hair sitting under umbrellas near the Skyline Chili truck. All sizes, shapes, and colors of hands fanning themselves in the August heat, feeling the spray of the fountain and the meaning of its inscription: to the people of Cincinnati. The next night, and the square was frozen in amber: umbrellas closed and chairs folded, tarp rolled down over the stage, policemen in their summer short-sleeved button-downs standing arms akimbo and staring beyond the barricades at a couple of Asian tourists, a few stray teenagers, someone waiting patiently with a video camera. The doors that led to the parking garage flew open and a group of overdressed night owls flew out, cackling in a party spirit, beglittered, breaking the silence with their unawareness of what had just happened. My reaction was naive and flippant; doesn’t this kind of thing happen all the time here? “This was kind of normal for us in New York,” said I. “It’s not normal for us here,” said mom as we drove north on 75, on the lookout for blue and red flashing lights. At home, we read details. Cop shoots sixteen year old boy. Shades of 2001. What’s a kid doing with a gun in Fountain Square? Did he have a gun? All night, we scrolled through Twitter reactions. Can’t wait to get the hell out of here, they said. SMH. What’s wrong with Cincinnati. The kid died the next day. I don’t have enough of this city under my belt to give you an educated or analytical response to what happened, but I can tell you that we felt this city shake. I know that in order to be a part of this city, I have to try to understand it better. The challenge is to grasp it fully, this place we live in, to dissect every layer of its strata, to inspect the fissures and striations, even as the ground keeps trembling beneath our feet. On our way back from the wedding this weekend (“the wedding by which all future weddings will be judged,” as it’s been dubbed), we stopped at the outlets on Interstate 71 to visit the Levi’s store. I’d been to these outlets once before, with my friend Dana back when we were in high school; we drove the whole 2 hours on our own, feeling brave, most likely with an REM cassette whirring on the Scirocco’s stereo. I bought a burgundy button-down long-sleeved shirt from Banana Republic that I ended up wearing well into college. How strange, then, to walk in there and see the very same colors of that long ago brave car journey. A table of corduroy pants folded neatly, relics of 20 years ago: burgundy, forest green, gray, rust. I picked up a pair of the forest green and held it in my arms for a moment, remembering the last time I wore those colors. The most jarring thing about being here in Ohio is trying to fit these old memories into the new pattern of my life. The Cincinnati that exists now is a different place than it was back then, just as I’m a different person than I was back then. I knew I’d have to come to terms with this place in a new way, that my old feelings about it would take on new meaning. But what I didn’t expect was how similar I’d feel, how provoked I’d be to remember everything exactly the way I felt back then. The thrill of driving two hours from home to shop at a Banana Republic; the giddiness of spotting someone at Lollapalooza in a Blur t-shirt as we stomped in our combat boots across a grassy hill; the crunch of leaves under foot and the feeling of fists shoved in the pockets of a hooded sweatshirt as we stand around a crackling campfire. I don’t mind the 90s revival trend. This is our chance to do that part of the past over again, and do it better. Acknowledging our bodies this time instead of hiding them. But it’s even more than that: this time, when I comb the thrift store racks for crushed velvet in burgundy and come out with a floral printed rayon dress, it’s nothing to do with fashion. It’s giving physical shape to those memories, allowing them to live in the now. I don’t mind the deluge of them hidden in the seams of the same fabric I wore the first time I thought I was falling in love, the first time I heard the words pretty little girl, she shines, knowing she is young, she smiles and was convinced every song was about me. I don’t even mind a few reminders of what I’ve learned since I wore that fabric: that love is not just about crying, that he is not The One, that not every song is about me. Now, when I pull on these clothes, they’ve been tailored by hindsight, stitched together with the knowledge of the differences between love and longing, between past and present. Standing there in that outlet store, I put back the forest green corduroys and settled on two different colors: rust and gray. Colors I never wore back then. Colors I look good in now. Early one morning, shortly after moving into this house, I was woken by the sound of a tree falling in the woods. We knew it had been a dry summer, and the sudden heavy rains were unkind to a few of the trees near our house. I stepped out onto the patio in my pajamas, rubbed my bleary eyes, and saw new bridges created across the ravine by fallen giants. The exposed roots, the weeping branches: each one seemed sadder than the next. I remember when a swath of trees fell during a particularly bad storm in Riverside Park back in New York. The fallen trees were a blemish. The city came and removed the trees, and left the gap-toothed smile there, laughing the entire stretch from 108th to 109th. As we stared at the fallen trees in our ravine, the chipmunks barked their lament, and we knitted our brows. I suppose we could just leave it there. Then we reminded ourselves that our little glass-walled house was about to see winter, that we had a wood-burning stove to fill, and that when a tree falls in the woods, and you hear it, it’s yours for the taking. We own an axe now, and are browsing chainsaws at the hardware store and educating ourselves in the ways of 2-cycle fuel. Our hands are forming blisters. We are becoming sturdier people. Outdoorsy. It’s possible I’m suffering the heightened emotions of a nostalgia dream. It’s very possible. I chose Cincinnati, Ohio, because I honestly think it’s one of the most beautiful places in the world. There is something truly special about this place that I wish more people would see. The rippling roads leading through neighborhoods bursting with trees. The horse farm in the middle of Winton Woods at sunset, the way the trail winds through tall old growth woods, and comes out again to surround the corrals. The questionable motel on Reading Road with the cylindrical lobby that in spite of its questionableness, we nonetheless stare at lovingly each time we pass it. The curves of old rooftops and statues embedded in buildings in Over-The-Rhine, the glowing crown of the city’s newest skyscraper, bridges stretching over the intense span of the Ohio River as it bends out of sight en route to the Mississippi. Not every yard in Cincinnati may have cornstalks and pumpkins, or chipmunks barking atop picnic benches and woodpeckers rat-a-tat-tatting the elm trees. There are flat parts and industrial parts; there are potholes and strip malls and traffic lights that are difficult to see. But there are also music festivals in these flat parts, chili parlors in these industrial parts. The strip malls contain businesses run by people who believe in sports teams that never win anything, and they are some of the nicest people you’ll ever meet. There are art museums and glasswork galleries beyond that dim traffic light; around the corner, pony keg stores with carefully hand-painted signs. It’s honestly one of the most beautiful places in the world. It makes me think about how we talk about things. How we categorize the good and the bad. Analyzing and re-analyzing and making lists of best ofs, most ofs, worst ofs, ticking off boxes of requirements for what makes a decent city. But when it comes down to it, maybe these places defy lists, and thrive on simple, honest love, an appreciation so personal and intimate that it’s hard to put into words. But what if we did try to put it into words? What if we shouted to the hills the things we love about the places where we live? THIS is why I love it here. THIS is what is so amazing about it. Would they hear us shouting out there on the coast? Would they hear us here on our own streets? Would they listen?